LAHORE: In a much anticipated development in the advertising industry of Pakistan, Orientm McCann Pakistan has been appointed by MCB Bank as their creative and strategic partner. Speaking at the contract signing ceremony, Fuad Mehdi, MCB divisional head corporate communications and marketing, said that in this day and age it was imperative for an organisation of MCB Bank's magnitude to partner with organizations which not only have a thorough understanding of their business, but also the agility required to stay abreast of the latest developments on the creative and media landscape and ever-evolving business needs. 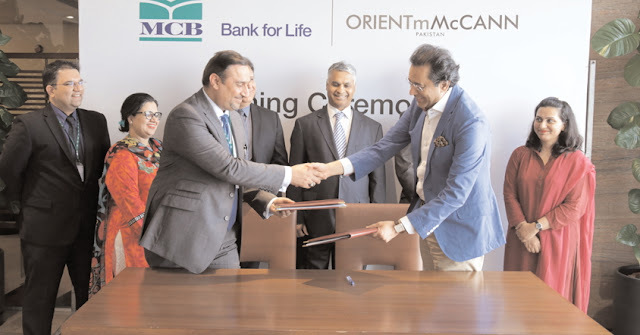 CEO of Orientm McCann Pakistan Mansoor Karim remarked that his advertising agency had the infrastructure, acumen and experience necessary to serve MCB Bank, one of the largest, most innovative and best banks in Pakistan. He also added that this partnership was a badge of honor for Orientm McCann Pakistan.